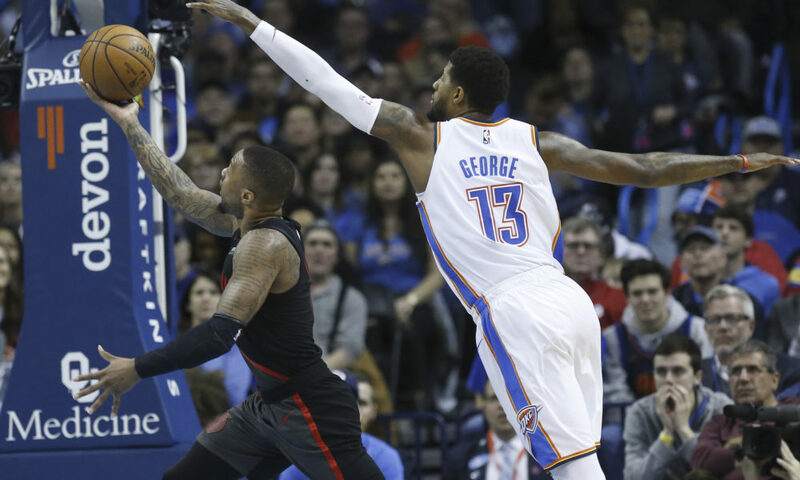 OKLAHOMA CITY, Okla. — A year ago, the Oklahoma City Thunder (29-18) had four opportunities to defeat the Portland Trailblazers (29-19) in the regular season. The Thunder found themselves on the losing end each time the two teams stepped on the floor. 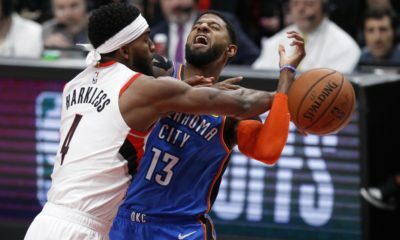 After an impressive 123-114 victory over the ‘Blazers tonight, Oklahoma City now has two wins in two games against their Northwest division rivals this year. 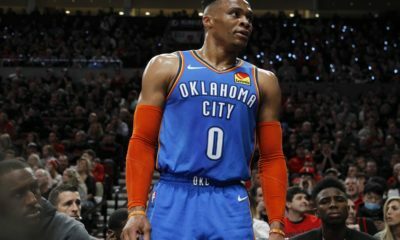 If you remember last week’s performance in a disappointing loss to the Los Angeles Lakers at home, the talk after the game was all about the Thunder’s inability to suddenly not defend the three well. What was once a trademark of their defensive identity, Oklahoma City looked a little lost defending the perimeter. Tonight, it was a much better showing. The Thunder held the ‘Blazers to 10-of-36 from deep. If not for a great third quarter where C.J. McCollum hit five threes — scoring 21 points in the quarter — Portland’s performance is much more regrettable than it actually was. Outside of McCollum’s seven three pointers for the game, the ‘Blazers shot a combined 3-of-24 from beyond the arc. Paul George led the Thunder with 36 points. 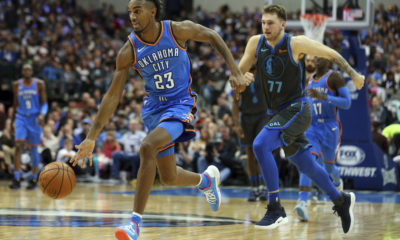 The five steals he pocketed all led to Oklahoma City points, with the exclamation point coming with under a minute left. George picked off a Lillard pass and turned it into a fast dunk, closing the game out for good. Russell Westbrook registered his 14th triple-double of the season with 29 points, 10 rebounds and 14 assists. Westbrook looked in control of the game from start to finish and even flashed some vintage Russ-finishes at the rim. Everyone will remember the two late dunks to cap off the evening. “I got hops,” Westbrook yelled to the crowd after an emphatic dunk. Despite a great win in a game Oklahoma City led throughout most of the contest, the Thunder were dominated on the offensive glass. A 20-9 offensive rebound discrepancy kept the ‘Blazers at arms length the whole night. Jusuf Nurkic grabbed seven of those offensive boards, registering 15 overall and scored 22 points. Even with Portland shooting so poorly from deep, the offensive rebounds and paint points never allowed Oklahoma City to run away with it. With the win, the Thunder are riding a three-game winning streak into a date with the Anthony Davis-less New Orleans Pelicans on Thursday night at Chesapeake Energy Arena.